The development of CGH has provided molecular cytogenetics with a powerful means to scan the entire genome, in a single step, for imbalances in chromosomal material. Comparative genomic hybridization effectively reveals any DNA sequence copy number changes (i.e., gains, amplifications, or losses) in a particular specimen and maps these changes on normal chromosomes. [1,2] Comparative genomic hybridization can detect changes that are present in as little as 30-50% or more of the specimen cells. It does not reveal balanced translocations, inversions, and other aberrations that do not change copy number. Comparative genomic hybridization is accomplished by the simultaneous in situ hybridization of two different genomes, the specimen (test) genome and the reference (normal control) genome. In order to distinguish the two genomes, total genomic DNA from each is labeled with different fluorescent colors and then both are hybridized to normal human metaphase chromosome spreads. The relative amounts of specimen and reference DNA hybridized at a particular chromosome position are contingent on the relative excess of those sequences in the two DNA samples and can be quantified by calculation of the ratio of their different fluorescent colors. 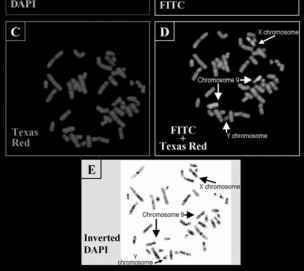 Specimen DNA is traditionally labeled with a green fluorochrome such as fluorescein isothiocyanate (FITC) and the normal reference DNA with a red fluorochrome such as Texas Red. A gain of chromosomal material in a specimen would be detected by an elevated green to red ratio, whereas deletions or chromosomal losses would produce a reduced green to red ratio. 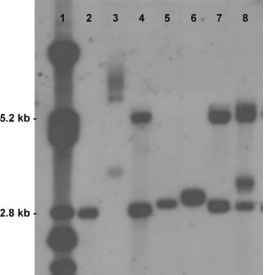 Figure 1 illustrates the fluorescence capture process as well as how a gain and loss are visualized and then mapped to their source chromosome. The sensitivity of conventional CGH is in the megabase range, with a theoretical detection limit of deletions estimated to be about 2 Mb. The detection limit of CGH therefore approaches that of a high-resolution karyotype (750-1000 band level) i.e., CGH can detect imbalances around 2-3 Mb in size. banding pattern (Fig. 1). 9) Quantitation of copy number differences by generating a ratio profile of the specimen to reference DNA fluorescence intensities along each chromosome. 10) Combining the profiles from several metaphase spreads to improve the significance of the result.